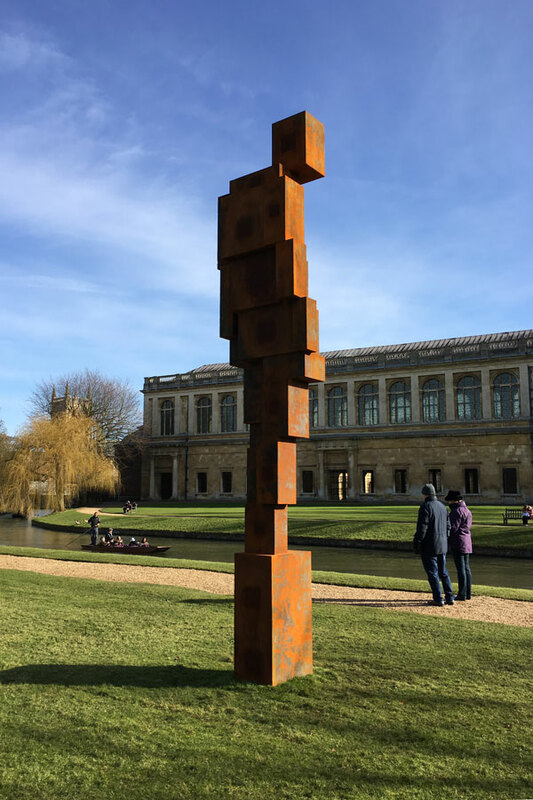 As part of the activities to mark the 700th anniversary of the early origins of Trinity College, a striking sculpture by Sir Antony Gormley OBE has been installed on the historic Backs at Trinity College, opposite the Wren Library and near the edge of the River Cam. Antony Gormley has links with the college, having read History of Art there between 1968 and 1971. His best known works include the Angel of the North, Another Place on Crosby Beach, Liverpool and Event Horizon at the UEA in Norwich. The work at Trinity College – Free Object – is part of the sculptor’s ‘Blockwork’ series. It is 5.5m in height, and being constructed from spheroidal graphite iron, weighs 11.2 tonnes. The sculpture is bolted to a concrete base and will remain on loan to Trinity College for 12 months. 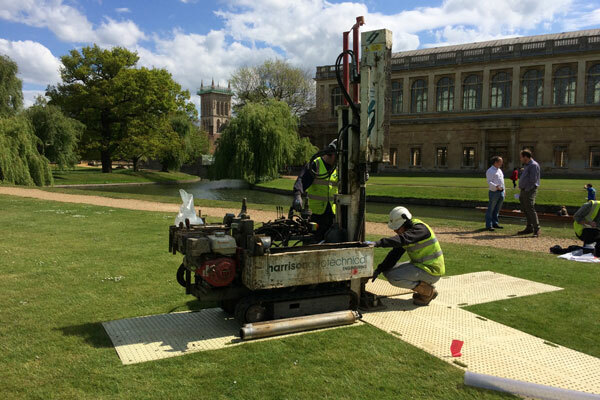 Trinity College needed to carry out a ground investigation at the location in order to design the foundation for the installation. The site is very sensitive – this was the first time that permission had been given to dig on the Backs – and it was a requirement to leave the site in a pristine condition on completion. As an additional element of the investigation bearing in mind the ancient nature of the site, the ground investigation team was accompanied by two archaeologists from the University of Cambridge. The study comprised sinking a number of Dynamic Continuous Sampling boreholes, testing samples from the boreholes in the company’s UKAS accredited laboratory and producing a report on the findings with recommendations for appropriate foundations. The investigation revealed that ground conditions comprised 1.5m of made ground over very soft cohesive alluvium to a depth of 4.8m. As a result of the presence of weak subsoils, the original shallow pad foundation design would have been inadequate to support the required bearing capacity of 25kN/m2, with the additional prospect of wind-loading giving rise to the risk of differential settlement. 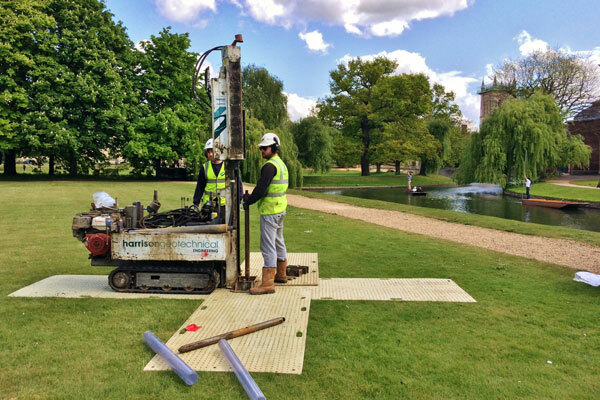 Instead, the use of small diameter displacement piles was recommended, end bearing in the river terrace deposits below 5m. All work was carried out to the satisfaction of Trinity College and the sculpture has now been installed.